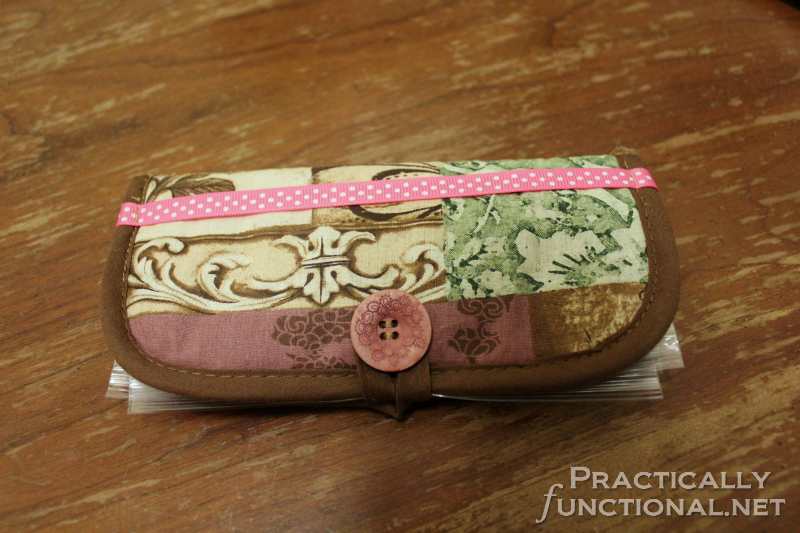 Home > Projects > Crafts > DIY Purse Organizer From A Hot Pad! The full tutorial for making these purse organizers is below, but if don’t want to make one yourself, I’ll make it for you! You can find these purse organizers in my Etsy shop in a variety of colors! I don’t know about you, but my purse is usually a mess! I have tons of little things floating around inside of it, and it’s pretty crazy trying to find anything smaller than my wallet. God forbid I ever have to ask JM to find my chapstick for me while I’m driving! 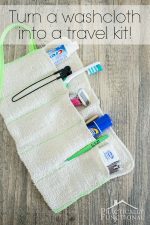 But this quick and easy DIY purse organizer I made out of a hot pad has totally helped! This thing is awesome! 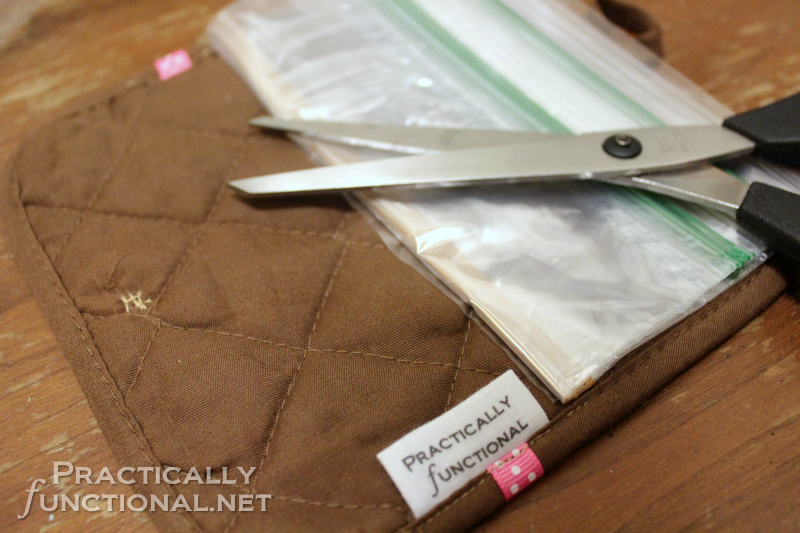 The plastic baggies protect my purse from spills and keep everything organized all in one place. It’s small enough to easily fit in my purses, and I can switch it from bag to bag. But it’s big enough that I can find it when I reach into my purse without hunting around for it. It’s perfect! If you want to decorate the outside of your purse organizer, do that first. I liked the fabric of the hot pads I found at the dollar store, but you can easily sew a square of fabric onto the outside of your hot pad if it’s boring. I did pretty mine up a bit by sewing a ribbon across the front. When you’re finished, your hot pad will be folded in half with the loop on the “back”, so take this into account when decorating. :-). Once the outside is decorated to your liking, it’s time to add the bags to the inside. Lay your Ziploc bags on top of the hot pad, alternating directions for each one, and pin them down so they don’t slide around while you sew. Make sure the bag openings face towards and away from the loop (like the picture below). 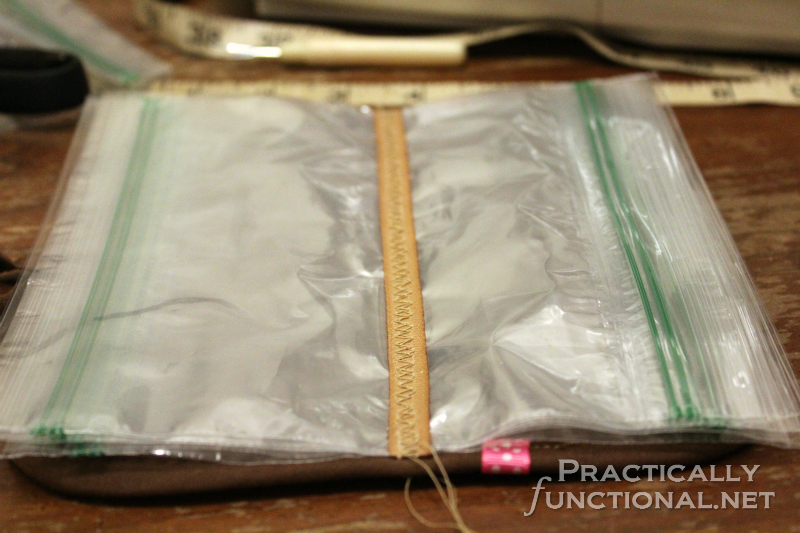 Sew the bags onto the hot pad with a zigzag stitch, right down the middle of the bags. If you want a bit of extra reinforcement, put a skinny piece of ribbon on top of the bags before you sew them down onto the hot pad. 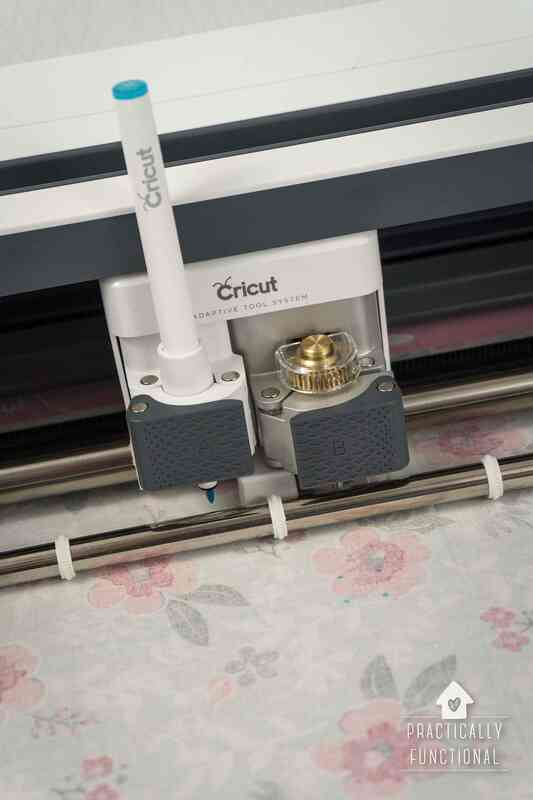 Once your bags are sewn on, cut off the extra ends from all six bags leaving a bit of plastic hanging over each end. Make sure not to cut the Ziploc side! All that’s left is to sew a button onto the front of the hot pad. 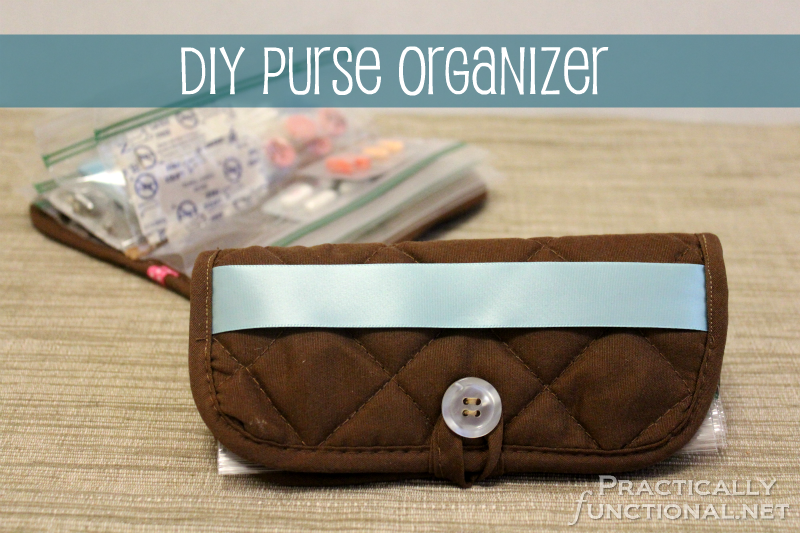 This way you can hook the loop around it to keep the purse organizer closed. Now fill it up and enjoy your totally adorable and totally useful purse organizer! 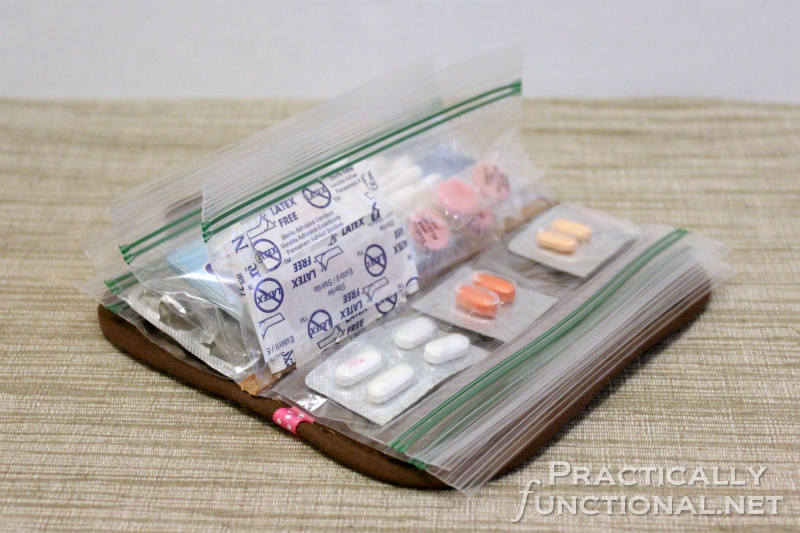 This thing is great to keep all of my little things organized; I always have cough drops and band-aids with me, and in the spring I always have extra allergy meds just in case. What are your absolute must-haves when you leave the house, besides keys, wallet, and phone? Is your purse or bag a total mess? If you want one for yourself, you can find them in my Etsy shop in a variety of colors! Great idea! 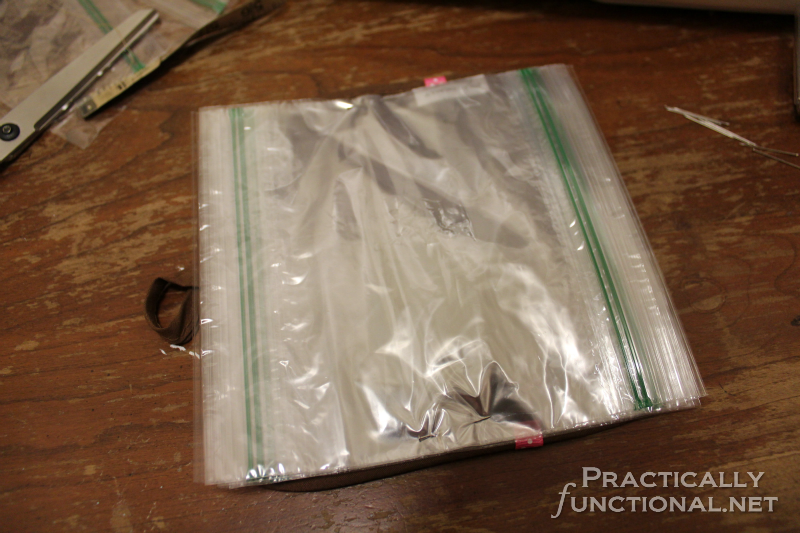 I used to make a larger version of this for a travel bag using gallon size bags and a placemat. Oh wow, what a great idea for packing in suitcases! I love it! I want to make some now. So cute and clever! Its such a cute organizer, just right for your purse. Terrific Idea! Like you said, my purse is a complete disaster and I love carrying big purses so everything just ends up floating around. Thanks for sharing! What a great idea!! I love that it holds all your little things that otherwise gets lost at the bottom of the abyss (or bottom of your purse). Can’t wait to make one!! Lol Dad! I can make you a “manly” one and you can stick it in your bike bag! Brilliant! This will definitely be on my to do list. Thanks! 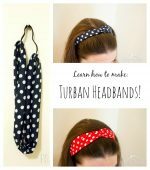 Pinned this awesome idea! Thanks! Genius idea! How long until you have to replace the bags usually? ;now this is a smart ideal. No idea Michelle! I just made mine pretty recently and I haven’t had the bags tear or get holes in them, but I imagine that could happen at some point. Just saw your link over at Six Sisters and had to come and check out your project. I’d love for you to link up a few projects at my weekend link party that is going on right now @The Weekend re-Treat! Very strange. I was in my favorite thrift shop yesterday & saw 1 of these for a $1.00. Couldn’t figure out what it was for. Thought it was clever, & was going to buy to use for coupons, but I didn’t think there was enough space for them. Do you think that instead of sewing the baggies on exactly in 1/2 it would still work if you sewed them on at 3/4 of the length so coupons would fit? You could definitely sew the bags on at 3/4 instead of half, the only possible problem is you still have to fold the hot pad in half to button it closed. As long as your coupons weren’t too stiff to fold, it should be fine! OR- what about stitching the baggies down the side directly across from the side with the loop. Then you would have access to the entire size of the potholder and baggies! It could still fold in half, since the zipper part of the bags would not have to be folded. I think it would open then like a book, loop on the right hand side, as well as the zipper openings for your baggies, and your ribbon/ reinforced stitching would be on the left hand side! Whatchathink?!?! Coupons are thin and flat and should fold over fine to hook your button closure!! Oh that would work super well for coupons! I love that idea! If you did two pot holders on top of one another, you definitely could have a “book” configuration with the full use of the baggies (except for the part you had to stick under your “Binding” ribbon with zigzag to hold them in) The top potholder sewn on would even hide the binding ribbon inside, and you still could put a cute ribbon and button enclosure on the open side. I like the idea of a contrasting fabric to cover the “spine” section. The bigger one would be good for a child’s travels- crayons, small note pads, even pieces of candy for a long trip. The child gets fussy on a long car trip or plane ride, and you pop out the surprise book. I’ve been using a little makeup clutch to hold everything so I can just switch it and my wallet back and forth between the diaper bag, my purse, and my gym bag, but maybe I’ll make a couple of these and then only have to switch my wallet. Plus, they’re super cute! And I like the placemat version idea another commenter mentioned. Whee organizing! Very clever and it looks great too! Great work! Love the idea! Thanks so much for sharing the great tutorial! Would love to have you visit me sometime. This is such a great idea.. I can see so many uses. Thanks for sharing! I love this small version! 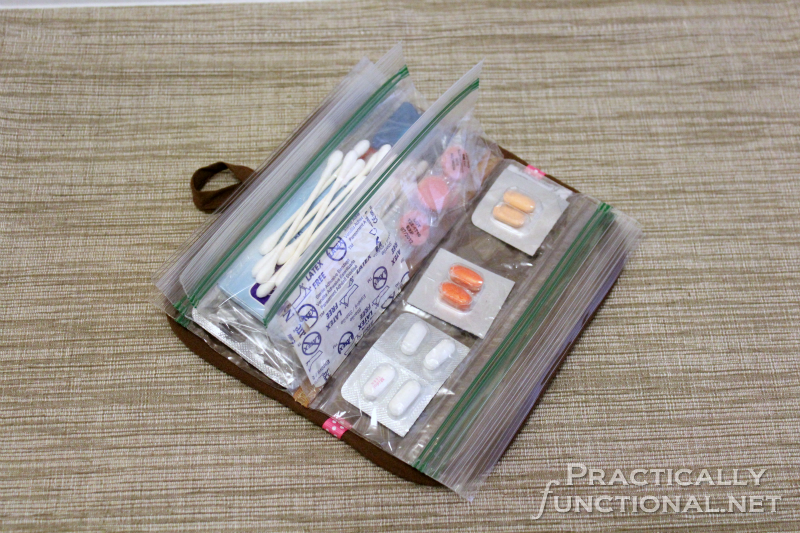 I have a bigger one made with a placemat in my car and I use it as a portable first aid kit. Found you over at I Heart Naptime! I’d love for you to come link this up at my Tuesday Time Out! What a great idea – I definitely need one of these. Thanks for sharing this at The Weekly Creative! Wow – such a cute idea!! Love it and pinning it. Thanks for linking up at Romance on a dime!! What a great idea! My bag is usually pretty organized, but not always. I could totally put this to use. Thanks for sharing at I Made It! Monday. Can’t wait to see what you link up this week. So cute and functional! Thank you for sharing! What a great idea girl! Brilliant! Stupendous idea! I just put a pot holder on my shopping list so I can do this! Could you please add me to your mailing list? Thank you!! I wonder about using these: http://www.ecozip-bags.com/Buy.html I bought them by accident once at the supermarket, and the size we got is essentially snack-sized on both sides – so zipper seals on both ends. Those would be totally perfect! That way you wouldn’t “waste” the bottom half of the baggie! I saw something similar, and they used snack sized plastic bags. 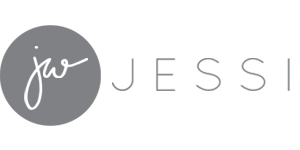 Using them is similar to using the EcoZip, but they can be purchased for a lot less. The snack sized bags overlap by about an inch, so there is not as much wasted plastic bag as with regular sized bags. How creative!!!!!! Great idea for Christmas gifts. Love it! Love it! Love it! I am going to make one of these today!! Hopefully I can find some real cute hot pads!! Thanks for such a great idea!! I made these as Christmas gifts last year, and I added a strip of elastic across the hot pad before adding bags. I use it to tuck in a small notepad & pen. It’s so helpful! Then I add bobby pins, hair ties, safety pins, & bandaids to get them started! What a great idea Sandy!!! Thank you for this usefull little thing! I love these. I made one for me and got tons of requests for them. Made one from a placemat and gallon size bags for a friend. I have used this tutorial and made some of these little organisers for my ‘Open House’ sale end June. 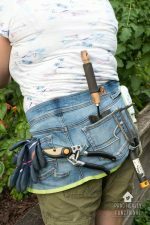 I have put a link to your blog on my blog so that there is no doubt that I did not come up with this idea myself! Smart! I usually just cut those off, but that’s a great idea! This is great idea. I used a potholder to make sunglasses protecters. Just sew one end and the side.! Perfect to keep scratche free. As others have said, great idea! I’ve lost a lot of weight and plan to alter most of my wardrobe. So, I’ve been buying very inexpensive notions in bulk–in part because I’m very cheap–and partly because having just the right zipper, etc. on hand keeps the creativity flowing. I detest going to the store in the middle of a project. My idea gets muddled, or I’m distracted by the other neato do dads–seriously, I’m like a monkey chasing shiny objects. Even when focused, the virtual sea of selections and prices knocks the fun right out of it. The absolute worst is discovering I already have several duplicates of the things I just bought, but didn’t see buried under other, similar items. Unless you don’t mind being overrun by baskets and sectioned organizers, storage options are limited. Until I saw your idea, the plan was to throw hundreds of new buttons in a basket and dig through all when I need one. If I make one organizer for every notion; attach a ribbon to the back; put one of each type in a clear luggage tag on the front; then hang them on a peg board, I can easily see what I have, and keep the items separate. Woo hoo! Thank you for saving me endless frustration!! Oh my gosh, that’s a brilliant idea! I love it!!! Definitely send me photos when it’s finished, I’d love to see it! You can email me at [email protected]. Freaking awesome. Great idea to have one for my large purse. So glad i found this to turn my old purse into a newdiy purse.